* A copy was provided by the author for review. To Sum It Up: Returned to her own time, Maggie anxiously awaits word from the Interchron team. It appears, however, that danger has followed her in the form of a powerful young woman with a talent for blocking Maggie’s neurochemical abilities. When some familiar faces from the future arrive at last, they’re not quite whom Maggie was expecting. Meanwhile, Marcus and Karl are on a perilous mission of their own to find and eliminate Colin, who is more determined than ever to kill Maggie. With the survival of the resistance against the collectives on the line, some tough battles lie ahead for both groups if they hope to see Interchron again. 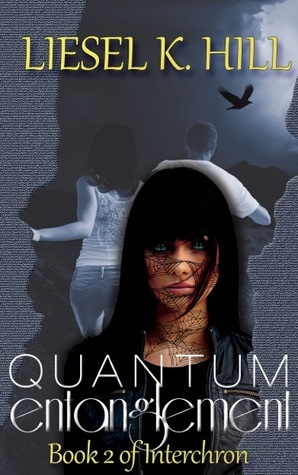 Review: The last two dystopian novels I’ve read have both been sequels, and I’m pleased to report that Quantum Entanglement is another winner. It provides just enough details from the first book, Persistence of Vision, to reacquaint you with the world and bring you up to speed with the characters while avoiding spending too much time recounting what happened before. It’s not long until the action kicks off, and it doesn’t let up from there. Quantum Entanglement finds the team split into groups, each on a separate mission. Maggie and her brother, Jonah, wind up being rescued by David, Lila, and Kristee, a new arrival to Interchron in Maggie’s absence and a time traveler, when Jonah’s girlfriend, Justine, turns out to be superhuman and homicidal. Meanwhile, Marcus and Karl are hunting another psycho, Colin, to remove him as a threat permanently. The novel shifts between the story lines, with the occasional look in on Doc and Joan back at Interchron. In addition to all of this going on, there are flashbacks and quite a bit of time travel. Thanks to the deft storytelling, though, you always have a firm handle on what’s happening, and the time jumps are never confusing. In fact, they supply insightful, and often chilling, glimpses into society at different moments in time. Maggie gets to see firsthand what the world is like right before its collapse, and it’s an eye-opening experience to say the least, not just for her but for the reader as well. Karl was my favorite character in Persistence of Vision, and Quantum Entanglement only endeared him to me more. I love his sense of humor, his devotion as a friend to both Maggie and Marcus, and the fact that he’s just a badass. You couldn’t ask for a better traveling companion or fighter by your side, and Karl’s personality was the main reason why his and Marcus’s chapters were my favorites. I was also really intrigued by Marcus’s flashbacks to his past; they shed a lot of light on his strained relationship with his brother, David. We learn something very interesting about Doc, too, but if you’ve been waiting for him to divulge everything that he seems to be keeping under wraps, you’re going to have to wait a little longer. Though I’ve been dying since the first book to know all that Doc appears to know but isn’t sharing, I have to admire his superior secret keeping skills. Quantum Entanglement seamlessly picks up where Persistence of Vision leaves off and takes you on an intense journey with its characters. From Maggie’s struggle to counter Justine’s seemingly unstoppable abilities to Marcus and Karl’s attempts to stop Colin, a sense of foreboding hangs over the novel. There’s quite a twist toward the end; I’m eager to see how it fits into the bigger picture of the next book, which, based on events here, promises to be a thrill of a novel. All in All: Liesel Hill continues to impress with this series. There’s no shortage of action and surprises in Quantum Entanglement, which, along with Persistence of Vision, should be on your dystopian to-read list. Thanks for letting me review your novel, Liesel! Looking forward to Book 3! Ohh I want to read this one! It's an excellent sequel. I especially liked all of the time travel in this one! OK, it's great to see that this is a winner just like the first book. I still don't think its for me but I do follow Liesl and I'm glad to see great reviews for her book. I've been uber choosy about the dystopians I've read this year, but I really enjoy this series. The world-building, which makes or breaks dystopia for me, is excellent. Ah! I still need to read book 1 and reading your wonderful review for the sequel here excites me even more :D Everything here appeals to me: the sci-fi, the characters, the suspense and all the twists! Thanks for the input as usual Lee, sequels can be hot or miss for me so I'm glad this one held up to it's predecessor; very encouraging! I've been super lucky with the dystopian sequels lately. I definitely recommend checking out Book 1!